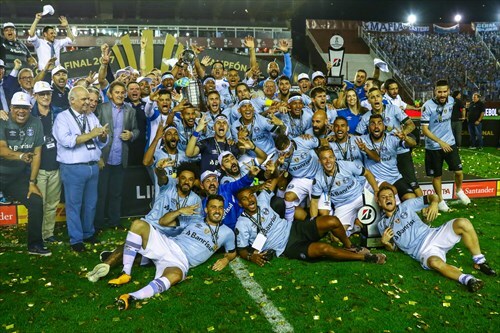 Grêmio have won the 2017 Copa Libertadores after beating Lanus in the final. They won the second leg 2-1 in Buenos Aires last night, claiming a 3-1 win on aggregate. Despite having more than 1000 channels on my Sky TV subscription here in the UK, there was, unbelievably, no coverage of the 2017 Copa Libertadores. Not even the final! Outrageous. And one of the clear disadvantages of living in the UK. Forget Brexit or the bad weather: the worst thing I need to deal with here is a lack of South American football. South America is the football factory of the world, where you see some really exciting games and have some of the most passionate games and best atmospheres anywhere in the world. 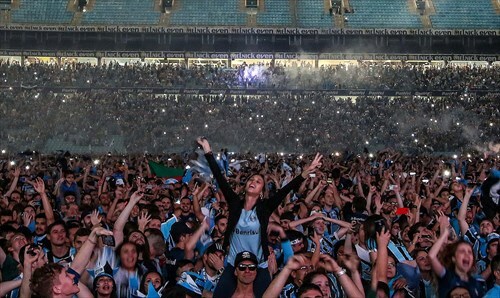 Just look at the party back in Grêmio’s stadium in Porto Alegre last night. The bottom line is that I had to make do with a slow, bad quality stream of last night’s game. At least it was still clear enough for me to admire the beauty of Grêmio’s two goals. The first was a blistering counter attack from Fernandinho, who showed no signs of his 32 years when carrying the ball from the half way line to the edge of the Lanus area, before firing an unstoppable rocket into the top corner. The second goal, also in the first half, was even better. Okay, the Lanus defence went to sleep, but the way Luan carried the ball past several defenders before dinking it over the keeper and into the corner was something special. Skill. Composure. Class. This lad impresses me more every time I see him. No wonder he continues to be linked with the likes of Barcelona and Real Madrid. And well done to him for turning down a big money move to Russia earlier this year, where he would have dropped out of the public eye. The man may not be earning shed loads of money just yet, but he will be one of the most googled footballers in the world today and he has won the biggest prize in South American football for Grêmio, whose fans adore him. And last night’s performance surely will have earned himself big-money move to one of Europe’s top clubs. Grêmio will play in the World Club Cup later this month and after representing Grêmio in that competition I think that Luan will probably move on. Another player that could be moving on is 21-year-old midfielder Arthur. He limped off injured last night and was in tears on the bench – I wonder if that means he will miss the World Club Cup? Either way, he obviously wanted to be on the pitch for the full 90 minutes, making sure his team won the game. This young lad has already received a call up to the Brazil senior squad. As for the game last night, despite one or two wobbles – conceding a penalty late on and being reduced to ten men for example – Grêmio were worthy winners. They had chances to extend their lead and although Lanus did exert late pressure, Grêmio’s solid defence, led by the impressive Pedro Geromel, their captain and one of the most impressive central defenders in Brazil. Lanus had overturned a large deficit to beat River Plate in the semi final, but it wasn’t to be two times lucky for them. They didn’t really have the class to break down a good Grêmio side. The other major thing that caught my eye on my wobbly connection during last night’s game was the noise from Grêmio fans inside the Lanus stadium. It was quite the party with their Argentine-style ribbons draped down the stands amid thousands of bouncing and signing fans. A good spectacle. This entry was posted in Libertadores, Match reports and tagged Grêmio, Lanus, Luan by Brian Davidson. Bookmark the permalink.